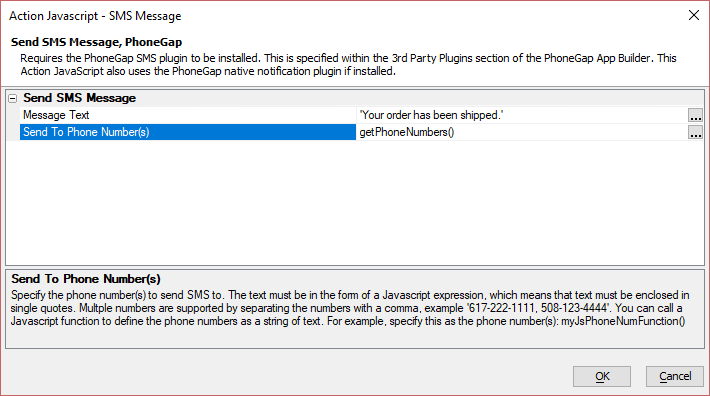 The PhoneGap - Send SMS message action sends an SMS message in an a PhoneGap application. It uses the PhoneGap SMS plugin to send an SMS message. The plugin is specified in 3rd Party Plugins in the PhoneGap App Builder. This action will also use the PhoneGap native notification plugin if it installed. If using a static message or dynamic message with variables, the message text must be enclosed using single quotes.